Kate Toci, named 2015 Charter Teacher of the Year by the Arizona Charter Schools Association, designs highly ambitious goals for each individual student, invests in students and others, and purposefully plans instruction on data. 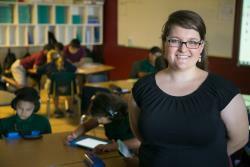 ARLINGTON, VA, October 7, 2015 – Imagine Schools is pleased to announce the Arizona Charter Schools Association (the Association), the largest charter support organization in Arizona, has named Imagine School at Camelback teacher Katelyn “Kate” Toci the 2015 Charter Teacher of the Year. Toci, an elementary teacher at this non-profit K-8 charter school serving 650 students in central Phoenix, is one of six exemplary educators recognized by the Association. According to the Association, the 2015 Charter Teacher of the Year designs highly ambitious goals for each individual student, invests in students and others, and purposefully plans instruction on data. With more than 550 charter schools in Arizona serving more than 170,000 students, Toci’s recognition is significant, underscoring the high expectations Imagine Schools has of teachers and educators. For Imagine Schools, Toci’s recognition is particularly meaningful, highlighting the organization’s belief that exceptional teachers drive a positive impact on academics, student character, and strong school culture. Toci will receive her award on Wednesday, October 28, 2015 during the Association’s Charter Awards Celebration. To learn more about the Arizona Charter Schools Association and the awards ceremony, visit azcharters.org or call 602-944-0644. 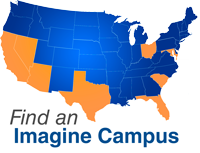 Imagine Schools is a national non-profit network of 63 public charter campuses educating more than 33,000 students in 11 states and the District of Columbia. Imagine Schools partners with parents and guardians to educate their children, providing high quality schools that prepare students for lives of leadership, accomplishment, and exemplary character. Learn more at www.ImagineSchools.org.